The company's modern sophisticated manufacturing facilities are located in Naroda, Ahmedabad, Gujarat state which is the main destination hub for chemical and pharmaceutical activity in India. The total built-up manufacturing facility measures 2864.8 sq. Mts. Which is a part of the well maintained landscaped plot of 5550 meters, with abundant greenery for fresh pollution-free environment. We are people who have a penchant for nature and life. 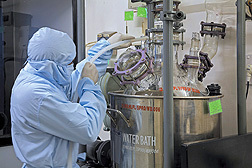 The production facilities conform to cGMP guidelines. The company is an 'ISO 9001: 2000 certified company.' 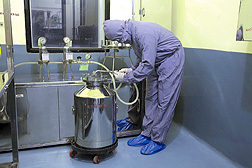 The 'clean room' for critical operations, has been specifically designed to conform approved pharmaceutical standards. It includes a modern well-equipped 'pilot plant'. +ve pressure differential from classified to non classified areas. Epoxy floorings in classified areas. All critical operations have independent AHUs with terminal HEPA filter. Control temperature NMT 25 deg.C. Purified water is collected in the DM water SS storage tank through SS pipeline. In the storage tank water is stored at 80°C temperature and distributed to users point. This water is continuously kept in circulation for the un-stagnancy to avoid the microbial growth. Halcyon Labs offers a plant for the manufacture of Cortico Steroids with USP specifications. 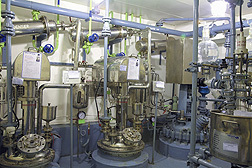 The plant is also equipped with membrane filtration techniques and micronizer for final solid handling. We have our own in-house affluent treatment plant. The affluents are treated as per the regulatory norms. All basic three stages i.e. primary, secondary and final tertiary processes are carried out at the affluent treatment plant to conserve and protect the environment.